A quick pop in to our local record shop "Refried Beats" - how great is that name? Chris floats around the store, checks every section for new and interesting albums. I tend to go to the back to the unloved and much neglected international section to look at albums from Brazil, Senegal, France and more. 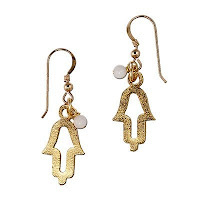 Ok won't write too much here, because it's Sunday, y'all are busy (not sure why I have a Southern accent) and many of you are interested in one thing: who won the Ettika Hamsa Earrings? Thank you everyone who entered the giveaway. Well, (drum roll please) the lucky winner is: Rachel Lynne! Rachel, I'll send you an email to get your address, but if you see this first, please free to get in touch. :) Hope you enjoy the earrings! Guys, it was so nice to do a giveaway, I hope to do another one again soon, so stay tuned. the pink top looks so organic on you - you're like Oriental Princess in these pictures! Beautiful outfit , I absolutely love your style !! I really think that RED is your color. great outfit and love the top. great pictures. i love your red pants! I love independent record shops, too bad there are few to be found in my area now. Love your red pants, your whole outfit matches the record shop nicely! Love the pics and shop setting. Love the simplicity and color use!! please check out my blog if you have the time for it. I can never do red lipstick and you rock it so well! but - So bold for me! Lovely casual look my dear! I love your outfit. Congrats to the winner. I love your daily posts natasha. Your blog is always colorful and refreshing. Congrats to the winner! love red and purple together! what a fun place to take outfit pictures! You look so pretty. Love your style. You look gorgeous! :) And thank you so, so much! I am so excited, the earrings are beautiful and I can't wait to get them! :) Thanks again for having this amazing giveaway!